The Secret Diary of a Princess: Marie Antoinette novel at a BARGAIN price, snap it up! If you only do yourself one favour today, let it be you snapping up the brilliant must-read historical novel The Secret Diary of a Princess by Melanie Clegg (Kindle edition) for the bargain price of £2.30 from Amazon UK or $3.69 from Amazon US. If you’d like to read an excerpt – the moment when Marie Antoinette meets Madam du Barry for the first time – head on over to Melanie’s blog, and read it there. Now, you may well raise up your skirts and be ready to squeal that you don’t have a Kindle, well neither do I, but I downloaded the free Kindle App for iPhone (I believe you can also get them for other brands of smartphone, anti-apple people ;p) for just such occasions as this (snapping up copies of favourite books for delayed travel emergencies & moments when you simply must have a bit of historical fiction to read, in order to escape from dreadful reality). The secret diary of the title belongs to the young Marie Antoinette, and in it we discover her innermost thoughts whilst viewing the turbulent events that shape her life. It’s immediately engaging, incredibly well researched and yet wears that research lightly, almost incidentally, because we become friends with her, we hold her hand and gaze – as she does – in wonder at the overwhelming brilliance and the spectacular world she becomes part of. This is history with a distinctly personal touch, and as a reader you are genuinely saddened when it comes to an end – you feel you have lost touch with that friend and are desperate to hear from her. I wasn’t quoting “brilliant must-read” by rote from anywhere, by the way. I happen to know it’s brilliant and a must-read firsthand, being lucky enough to have read it previously, before it was properly published. However, I am so excited about the fact it’s now available for Kindle (and at such a reasonable price), that I have purchased it and mean to re-read it again very soon – the perfect antidote to tedious train journeys or vapid lunch-hours. Today I am also wearing a suitable perfume (I think, anyway) for the era and ambiance this fictionalised account of Marie Antoinette’s early years creates. Although it’s distinctly a modern fragrance, Ormonde Woman, by Ormonde Jayne perfumes, begins in a heady puff of Black Hemlock absolute (usually associated as a poison!) infused with cardamom, violet, jasmine, vetiver and a woody-amber drydown that’s all powdery, soft and veritably dripping with sensuality. I was lucky to be treated to a bottle of this by my fiance, recently, and it’s simply sublime! I certainly feel as though I should be wafting about a candlelit ballroom with it on, or applying rouge and carefully placed patches whilst a maid powders your hair. Whether it’s a totally wonderful historical novel, or a decadent new perfume to try whilst reading it, I do hope you’ll enjoy it – I know I did! Last night, Deanna Raybourn made me cry. I was going to say “not deliberately, of course”, but it was deliberate! Quite purposefully done, indeed. Disgraceful behaviour. I finally got to finish reading Dark Road to Darjeerling – Raybourn’s fourth book in the Lady Julia series, which, to date, has been the most gripping series of novels I’ve had the pleasure of reading. I say ‘finally’ finished, as it’s been sitting beside my bed, looking at me in a disappointed manner, for the last few weeks. Tsk. Vintage Coalport Indian Tree teacup & saucer from Elmstreet Market: $39 One of my favourite things is to cosy up with a cup of tea & a good book. This would be a fabulously extravagent way to enjoy a brew, I love the bold pattern & colours. Organic Darjeerling Tea by Peacelovetea: $10 I drink both tea and coffee, but forced to pick, it would be tea every time. Tea, chocolate and a good book is my idea of Heaven. It certainly hasn’t been lack of interest keeping me from reading it – I’ve practically been slavering to get my hands on it since finishing the third one – but I’ve had so much work reading to do (for various articles hither & thither) that I’ve had no time for pleasure-reading. For shame! Embroidered Indian Slippers at Tati Tati Vintage: $25 Perfect for adding an exotic touch to your breakfasting or lounging-about ensemble, and far more stylish than fluffy bunny slippers, non? 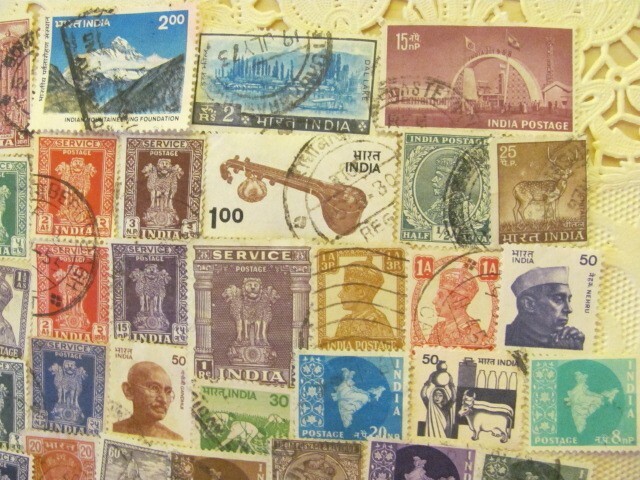 50 Vintage Indian stamps at Precious Owl: $4.00 - The colours of these vintage stamps are amazing, I think they'd look really good grouped together as shown and framed, or for use in a craft project. They range in date from the early 1900's to the middle of the century. Little pieces of history. For the last couple of weeks, though, I’ve had a trapped nerve in my back, and that has forcibly slowed me down & given me time to catch-up with some old friends. Vintage Indian Cricket Box from Nonnie60: $18 Maybe I wouldn't keep crickets in it; I'm thinking more along the lines of perfume bottles on a dressing table, or scented soaps in a bathroom. 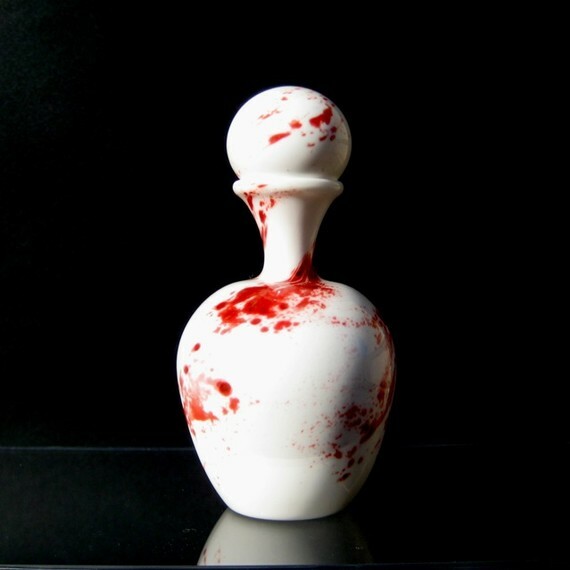 I'm all for re-using beautiful and unusual objects in unexpected ways. Decorative Peacocks Card by With an Indian Touch: $4.00 This card is designed by Radhika, a Textile Designer from India who's now settled in Canada. I'd be very tempted to frame this instead of giving it to someone! Her Lover Returns, 1871 Illustration from Surrender Dorothy: $16:89 Another quirky illustration I couldn't resist. Don't buy utterly dull generic posters & mass-produced prints - source unusual pieces like this to frame. Love her wistful facial expression. She's waiting for some no-good bounder, I bet. This could only be improved by having her hand to her forehead, I think! Vintage Anglo-Indian Hair comb from Elronds Emporium: $25 On Bad Hair Days (of which I have many), I'm a big fan of twisting it into a chignon or bun and shoving a pretty clip to hold it. You usually get the most compliments on the least you've done to your hair, don't you find? This comb is simply stunning. You don’t have to have read the others books in the series to enjoy Dark Road to Darjeerling, but I would say it vastly improves (obviously) your understanding of the nuances between the various relationships, and merely for your own bring-out-the-smelling-salts swoonsome enjoyment of following the romance between Julia and Brisbane. Just go and read them all. 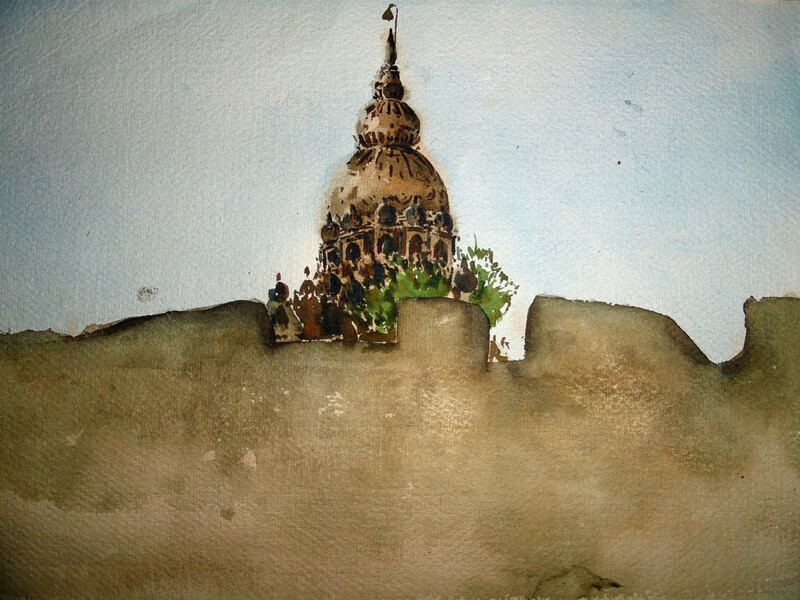 Temple at Dusk by Adix1977: $38 This is an original watercolour painting, signed by the artist, who was born & raised in Bombay. I love the feeling of mystery - wanting to climb over the wall and explore, and the beautiful way she's captured the light. Whiting & Davis Mesh Snake Bracelet from Collectible Oddities: $47 I hate snakes, but have always loved snake jewellery - especially bracelets. Go figure, as our American chums would likely say. I can see this one worn high-up on the arm, with a floaty maxi dress. Adorable. Dark Road to Darjeerling was certainly worth waiting for. All the elements were there – murder, mystery, murky family secrets, all in a wonderfully realised exotic location and laced with Raybourn’s eye for detail and that great balance of darkness and light I love so much. Set of 100 Peacock Place Cards by Timeless Paper: $100 These are so pretty and unusual - great for a theme based around peacock feathers. Peacock Print by Berkley Illustrations: $18 Another peacock-themed item - I just love Berkley Illustrations, they're full of so much character. This chap looks so dignified. Some writers really struggle with one voice or the other, Funny v Serious, but Deanna Raybourn seems to glide effortlessly from one to the other, with great fistfuls of breathtaking plot along the way. Oh, okay. About the crying, then. Darjeerling Tea Silhouette by Barking Mad Arts: $15 This wonderfully eccentric silhouette really puts me in mind of a particular character, and I just love it. Would definitely give this wall-space! Antique Crocodile French Doctor's Bag from Sally Luv Rose: $75 - I know it isn't as practical as modern luggage, but vintage pieces like this are so romantic looking. I wonder where this bag has travelled to and what it has seen? Again, I cannot go into details for fear of spoiling the dénouement, but there is a particular scene in which Something Happens, and a short speech one of the leading characters gives in order to help another leading character deal with the aftermath [please forgive such convoluted ways of avoiding spoilering!] – and it was at this point I cried. The whole scene was handled with such overwhelming tenderness it just broke my heart. Mini Indian Spice Kit by Purpose Design: $12 A great gift for someone who loves cooking, perhaps to give alongside an Indian cookbook. My favourite flavours, hands down. After reading the third in the series – Silent on the Moor – I was inspired to write a post in which I breathlessly exclaimed how much I loved the novel; and went on to specially create an Etsy Treasury based on it (a themed selection of items currently available from sellers on the shopping site, Etsy). I really enjoyed putting that collection together, and thought I’d like to do the same for Dark Road to Darjeerling. So I did. If you click on that link, it will whisk you to the full-sized Treasury, which is a bit easier to browse through at your leisure. GirlEbooks is a brilliant website which “aims to make classic and contemporary works by female writers available to a large audience through the ebook medium.” It’s mainly the work of Laura McDonald and her mum, Joyce, with other contributing bloggers, and I happen to think it’s utterly wonderful. Yes, there are many websites with free ebook downloads, but I particularly like the selections on offer here – they sort the wheat from the chaff, as it were. You can get ebooks in lots of places on the internet, but our ebooks are hand-crafted and professionally formatted. Each ebook has a linked table of contents and text reflow for small reading devices. We create covers, correct errors introduced by digital conversion, and offer the ebooks in multiple formats to accommodate most ebook reading devices. All of our ebooks, even the ones in the ebook store, are DRM free (no digital rights management). This means that once you download the ebook, it is yours forever. If you have ever heard me warbling on about one of my favourite ever authors – Georgette Heyer – and wondered what all the fuss was about, well, now you can find out for free by downloading The Black Moth (her first novel, published in 1921). It was also the first book of hers I read, a mere whipper-snapper myself, and I fell completely head-over-heels in love with her wit, sense of drama and the devastatingly attractive pictures she paints of complete cads and utter bounders. Heady stuff for a young gal and gave me a taste for very clever, sarcastic men. Oh dear. First published in 1823, these memoirs were written by the first lady-in-waiting to Queen Marie Antoinette of France. Madame Campan became close to the Queen during her 18 years in service. Her memoirs divulge details of the daily life at the royal court as well as recount the events of the Revolution from the royal family’s perspective. I’m reading this one at the moment, and it’s absolutely fascinating. Click the picture to be whisked to the download page. Highly recommended! The Duchess of Devonshire’s second book, first published in 1778, chronicles the life of a young, newly married lady of high society not unlike its author. Written in epistolary format, the story follows Julia from her idyllic country life to her marriage to a rich aristocrat. She soon discovers her husband is nothing other than a rake, spending all his and her money on gambling and mistresses. An anonymous guardian, in the guise of The Sylph, writes to her, giving her guidance through her troubles…but will it be enough? Cecilia, or Memoirs of an Heiress, was Fanny Burney’s second novel and was first published in 1782. It is the story of Cecilia Beverly, a young and beautiful heiress whose army of suitors is made up of gentlemen, scoundrels, and many who are not what they seem. Admired by Jane Austen and many other contemporaries, it is said that the title for Pride and Prejudice is taken from the last pages of Cecilia. Belinda, first published in 1801, is the story of a young woman who comes of age amid the distractions and dangers of London society. Belinda stays with both the extravagant, aristocratic Delacours and the sober, rational Percivals and molds her views on love and marriage from both. Admired by her contemporary, Jane Austen, Edgeworth tackles issues of gender and race in a comic and entertaining novel of manners. Comedies of manners don’t always time-travel well, but in Belinda (for the most part) the comedy still remains fresh, I think, which is something that can be a bit lost in some older novels. Lavish descriptions of costumes, too, which is always a boon. Oh I still love this one – an especially good choice if you’re feeling under the weather and just want to curl up in bed with a heart-warming story that will definitely bring a smile to your lips. You can’t beat a bit of Agatha Christie – another good choice for when you’re feeling poorly, I think. This is her first novel, published in 1920, and introduces us to the enigma that is Hercule Poirot, who went on to appear in 33 of her novels and 54 of the short stories. Anyway, this is a mere glimpse, a veritable smattering of my favourites, but you should go and explore for yourself – GirlEbooks is a treasure-trove of good reads, and perfect for dipping your toes into the works of authors you have always wanted to try, those books you always meant to read, and some you’d never heard of! Melanie Clegg – author, history buff, blog-writer and all-round good egg – has just published her second historical novel, Blood Sisters. What’s more, it is completely FREE to download until midnight tomorrow (June 15th)! Click HERE to be whisked to the download page. So, what are you waiting for? Go and get it, immediately, I compel you, dear hearts. You wont be sorry, and I am convinced you’ll be back for more from this author. Her first published novel, The Secret Diary of a Princess, was one of my favourite histroical reads of last year. My dad told me this riddle when I was a little girl. It cracked me up. I appreciated the play on words and I am sure it went some way to starting the fire below my burning passion for typewriters, newspapers and, particularly, the beauty of fonts. For a little while, I was the sub-editor for a local magazine in Brighton, here in the UK. It’s probably the happiest I have ever been at work. I got to circle other people’s copy in red pen, I got to play with fonts and buy fonts and introduce other people to fonts… glorious! For a while, I couldn’t read any other magazines, though, as I saw with a creeping sickness the old familiar press releases used word-for-word in place of an actual interview, I saw glaring mistakes that should never have made it past the subs. Took me years to get over. I used to proudly reel off all the fonts used in any publication you cared to mention. I couldn’t do that now. I kind of miss being a font nerd!